Sasha Waltz and Guests in Continu. 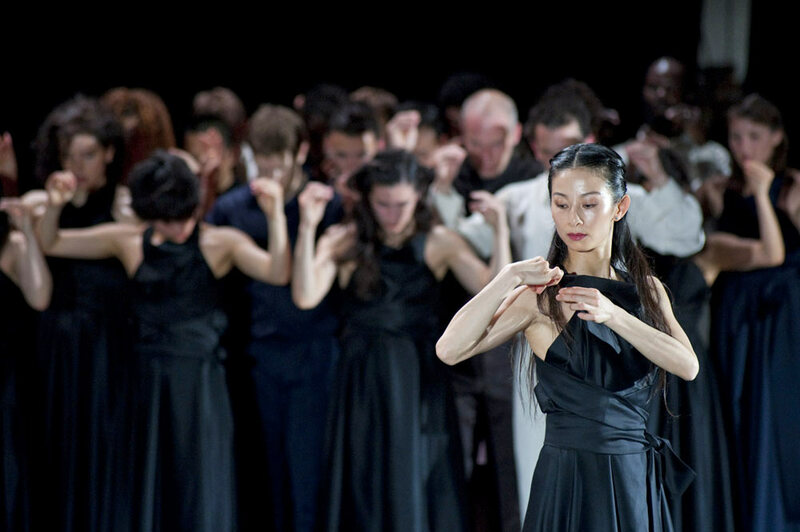 In sorting myself out for this visit I pulled a few random Sasha Waltz reviews, and comparisons with Trisha Brown and Pina Bausch often floated up, as they did in the performance interval. Of course Waltz is her own showman, but I too see some elements in the comparisons in Continu. Sadly I don’t think it’s so flattering to Waltz who doesn’t have the fun and humanity of Bausch, and Trisha Brown has never connected with me – too dry and clever-clever; I always have the feeling of lacking the PhD to ‘engage’ appropriately. Sadly Waltz’s individual stirring of the choreographic and dance-theatre pot does not take me much beyond those feelings, although there were very bright moments in the show. The room, or set in this case, was a three-sided black box made of approximately 100 identical mat black rectangular sheets. It’s no room at all and you can’t hide from life, it seems to say. It’s credited as the design work of 3 people – gulp. Also credited is a dramaturg and the dancers get the choreographic claim as such – Waltz travels under the banner “Direction and Creation”. Perhaps there are too many cooks which led to my feeling of little coherence and more a series of (odd) happenings or, more often than not, general’ listless movement. If my overall feelings seem gently unhappy I should say there were some wonderful takeaways from the show (just not 2 hours worth!). The musical choice, built around Edgard Varese’s “Arena”, was inspired – here is big, muscular music at turns ominous and titanic, with shades of Stravinsky’s Rite of Spring and Britten’s Prince of the Pagodas. Not a long piece of music, the evening is built out with percussion, played live on stage at the start of the show by the charismatic Robyn Schulkowsky, and rounded off by Mozart’s Oboe Quartet. The opening movement (accompanied by Schulkowsky) for 7 girls seems almost voodoo-like in its flailing of limbs, but later it’s the strong group work one remembers – densely packed into a huddle, the dancers shimmer or explode, often behind an individual trying to make their way in life and yet controlled by the group – Niannian Zhou is particularly memorable in one section. There is also what seems a pure Bausch moment as two men, each twitching uncontrollably, have a mock fight; all front, neither is capable of anything effectual, but neither can they back down. The programme notes (sadly no link available) are a good introduction to Waltz and this piece in Exeunt magazine talks to Waltz specifically about Continu and its black (society vs individual) and white (individual inner-world) structure. Required reading for those who are attracted down the PhD route to dance enjoyment. Waltz is about big ideas in Continu but if you don’t pick up on them there is not a lot of choreography to keep you going.